Team 10's Adam Racusin looked into ways you can save money. 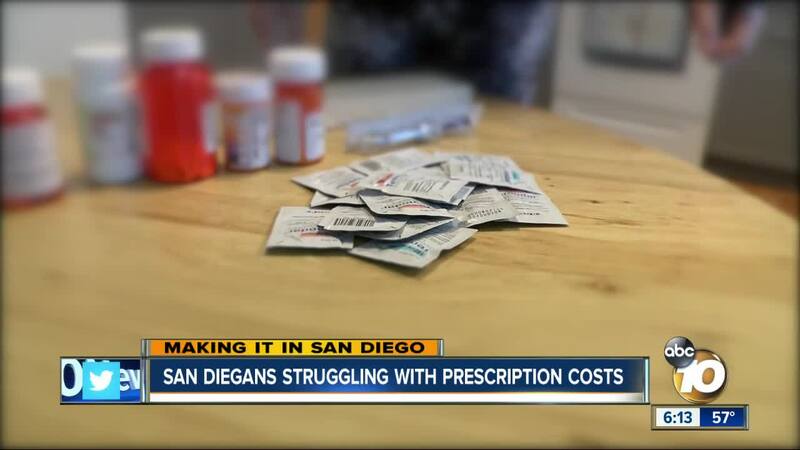 SAN DIEGO (KGTV) - Prescription costs are pushing some San Diegans toward financial ruin. Prescription drug prices are rising much faster than inflation rates in the United States, according to a recent article by ABC News . Experts describe the rising costs of prescription medication as unsustainable. “I would say that it is catastrophically out of whack,” said Gloria Rickerd. Around the start of 2018, Gloria Rickerd’s husband David was diagnosed with glioblastoma. It’s an aggressive type of brain cancer that can be very difficult to treat. Gloria says the average lifespan after diagnosis is between 12 and 24 months. "Courtesy of having incredible doctors and good healthcare, he is still here after a year,” she said. Along with the emotional toll etched into cancer treatment, there's the financial toll. Procedures aren't cheap, and the price of the medication can be lethal. “A $400 copay for 15 capsules for a five-day supply,” Rickerd said. David only has a handful of prescriptions, but without help, the co-payments could break their family financially. Gloria estimates 50 percent of their income goes to healthcare; 20 percent of that to medicines. "It’s incredibly frustrating that families are expected to deal with these things without any training with limited resources,” she said. According to a report from the AARP Public Policy Institute, the retail prices of some of the most popular prescription drugs take to treat everything from diabetes to high blood pressure to asthma increased by an average of 8.4 percent in 2017. 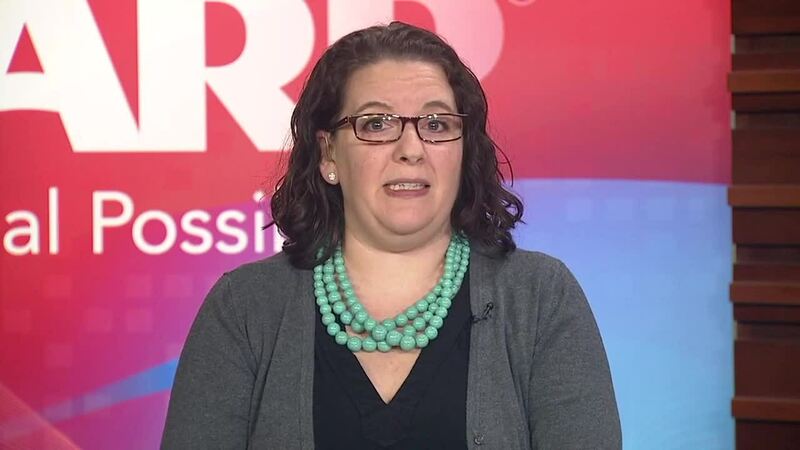 “People simply can't afford their prescription drugs,” said Leigh Purvis, director of health services research for the AARP Public Policy Institute. “The prices and costs associated with them have gotten so high that people are walking away from the pharmacy counter." Purvis says the main reason for the increase is because there’s nothing to stop it from happening. “There’s nothing in the U.S. healthcare system that will stop drug manufacturers from setting really high prices and then increasing them pretty much whenever they want,” Purvis said. She told 10News they are seeing a lot of brand name drugs coming on the market that aren’t facing generic competition. Without competition, the costs can skyrocket. According to the AARP’s “Rx Price Watch Report: Trends in Retail Prices of Prescription Drugs Widely Used by Older Americans: 2017 Year-End Update” the annual average retail cost for just one popular brand-name drug among the 267 that AARP studied would have been nearly $6,800 in 2017. But had pharmaceutical price increases been limited to the country’s general inflation rate between 2006 and 2017, that cost would have been more than $4,600 lower. Retail prices increased in 2017 for 87 percent of the brand-name drugs studied. While lawmakers debate ways to fix what many consider a crippling problem, there are simple solutions to cut some costs. Some websites allow you to search prescriptions, compare costs by a pharmacy, and get coupons. If you have the option, experts 10News spoke with suggest buying in bulk through mail order. Also, if you’re at the pharmacy counter make sure to ask if there's a generic or alternative available. "I basically Googled patient assistance programs, patient copay assistant programs, and I listed the name of the drug I was looking for,” said Rickerd. Gloria says she was able to call the manufacturer and find a program that eliminated the co-pays. She says even if you think someone’s going to say no, it’s always worth trying to get a discount. In San Diego, many people live close enough to the border they head to Mexico to buy prescription drugs at what they say is a lower price. 10News checked with U.S. Food and Drug Administration and Customs and Border protection on whether that’s even legal. A spokesperson for the FDA says in most circumstances, it is illegal for individuals to import drugs into the United States for personal use. “The FDA cannot ensure the safety and effectiveness of medicine purchased over the internet from foreign sources, storefront businesses that offer to buy foreign medicine for Americans, or during trips outside the U.S. Such drugs present risks to American patients, including the risks that such drugs may be contaminated, counterfeit, contain varying amounts of active ingredients or none at all, and/or contain different ingredients than the FDA-approved product. In addition, the directions for use could be misleading or inaccurate, the recommended dosage may be harmful to the consumer, or the contraindications may not contain all of the products the user should avoid when taking the medication leading to serious injury, illness, or even death. For these reasons, FDA recommends only obtaining medicines from legal sources in the U.S.FDA’s personal importation policy [fda.gov] (PIP) describes its enforcement priorities with respect to the importation of unapproved drugs for personal use. This policy is applied on a case-by-case basis and is specific to the individual merits and facts surrounding an individual’s drug offered for import. Under PIP, several factors are considered in determining whether or not the agency intends to object to certain personal imports of unapproved drugs:• The drug is for use for a serious condition for which effective treatment is not available in the United States;• There is no commercialization or promotion of the drug to U.S. residents;• The drug is considered not to represent an unreasonable risk;• The individual importing the drug verifies in writing that it is for his or her own use, and provides contact information for the doctor providing treatment or shows the product is for the continuation of treatment begun in a foreign country; and• Generally, not more than a 3-month supply of the drug is imported."